Crowns are caps used to restore the natural crown of the partially destroyed tooth. It implies the existence of part of the tooth structure that will be restored to which it will be cemented. 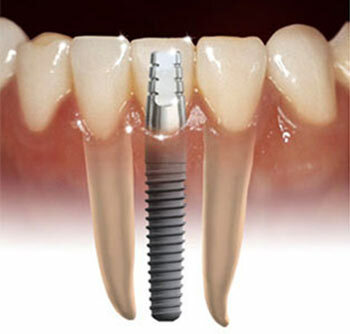 The implants are used in case one is missing one or more teeth and it is necessary to use fixed prosthesis. In these cases, they work as natural roots. They are also used in toothless patients whose bone structure and mouth mucosa do not allow the use of a comfortable and stable complete prosthesis. In this case, they work as prosthesis retainers. The implants are the perfect solution for toothless patients, in order to radically improve their quality of life. That denture that compromised the chewing process and even prevented you from smiling is a thing of the past. The new denture fixed in place by the strength of the implants, makes the patient believe he/she has natural teeth. It restores confidence and self-esteem. Read more on Implants. The bridge is a prosthetic restoration intended to replace one or more teeth that is supported by the teeth around the toothless space. The suspended elements are called pontics. The removable prosthesis can be partial or complete. The removable partials can be fully acrylic or can have a metal part called skeleton and are used to replace one or more teeth. These last ones are known as skeletal. 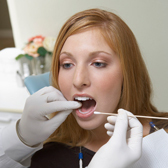 The removable partial acrylic prostheses are most affordable and should be only temporary. However, they are the most commonly used in Portugal for social-economical reasons. - If one chooses to use a removable prosthesis, we recommend to have a replacement one, if it is affordable. This is a way of avoiding setbacks if you break your prosthesis. This additional prosthesis may have less teeth and be fully acrylic. This way, it is more affordable. The fixed prosthesis is the perfect option for the patients who are missing just a few teeth, not only because they are more comfortable, but also for esthetic reasons. However, it is more expensive than a removable prosthesis.